This page details the Miss Louisiana Teen USA titleholders who have competed at Miss USA or competed in Miss USA state pageants. Click here for a full listing of Miss LA USA & Teen USA titleholders. Four Miss Louisiana Teen USA titleholders have competed at Miss USA, including Ali Landry (1990), the first former Teen state titleholder to win the Miss USA title (although not the first to hold the title - that honour goes to Shanna Moakler the year previously). 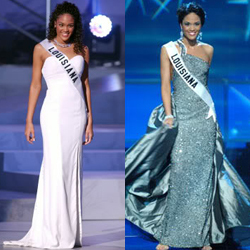 2009 fourth runner-up Brittany Guidry made top five in her home state at the Miss USA 2014 pageant, held in Baton Rouge. Prior to Brittany, the most recent Teen titleholders to compete in a state pageant were Nina Moch (2000) who was a runner-up in Georgia in 2007 and Megan Bologna, unplaced in Louisiana the same year. Miss LA Teen USA 1998 Jennifer Dupont is one of a small group of Triple Crown titleholders who have competed at both Miss USA and America; she placed first runner-up at Miss America 2005!